We are starting to transition from winter fishing to spring fishing, but with snow in the forecast we have a few more cold fishing days left. Hopefully Western North Carolina fly anglers will find this helpful next year also. Asheville and Pisgah National Forest can be very similar to the Rocky Mountain west during the cold months. You can expect to find big fish in slower water and a lot fewer people. If you want quality trout of quantity winter is a great season to fly fish. Just bring warm layers and a thermos of coffee. Fish deep and slow. Looks like Russ has a worm tied on. Be sure to fish worms, eggs, mops, big hares ears and stones. Freshwaters Illustrated and The Little Tennessee Native Fish Conservation Area put together this great video about The park services work on Brook Trout Restoration. Great Read about one of our favorite species. The Southern Appalachian Brook Trout. We are blessed to have tons of the fish around the Asheville area in most all of the Pisgah National Forest Streams. How to adjust your nymph rig depth to miss fewer strikes. 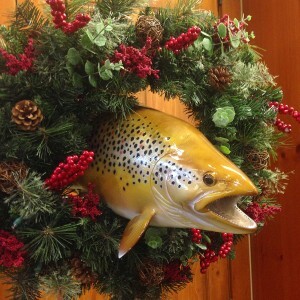 Trout eat slowly during the winter and are sitting in slower water. This video will help you fine tune your rig. One look at the indicator display in any fly shop can send even experienced anglers running back to the dry fly bins. Some of the longest conversations I have with anglers in the shop revolve around which indicators would be best for a given situation. I love all the indicators available and each one is king at the right time so I wanted to share some of what I think they do well. The three types below are the three I use most often on the Davidson River and Watauga River. These indicators, (bobbers) lol, are the king when it comes to staying afloat. If I am fishing heavy flies or lots of shot these are my go to indicators. High water is another place these guys shine. You can’t sink these indicators and even if a big wave swamps them they pop right back up. I most often use the 3/4” size, but the 1 inch are great when fishing really heavy. The drawbacks to this indicator are that you need a thick diameter leader/buttsection to keep them from sliding up and down the leader. That is not a problem when I am fishing in the conditions above, but limits their versatility. Because they float so well fish do feel the resistance from the indicator when they eat the flies below. In fast water no problem, but in slower water I’ve found that fish spit flies faster as a result. Also in slow water these indicators land with a loud plop and can spook fish. High Water on the Watauga River is the ideal place for these indicator types. I’ll try not to sound too biased here. Yarn is awesome. I have used the ORVIS Assortments, New Zealand Wool, and Lefty Kreh yarn and like them all a lot. Yarn doesn’t float quite as well as the thingamabobbers, but the ORVIS assortment comes in enough sizes that you can put on a big piece or even two when high water is present. I think fish hold on to the flies longer with yarn than almost any other indicator. I switched to yarn in slow water 4 or 5 years ago and my catch rates doubled. Yarn also lands without making a sound and hardly a ripple. It also comes in colors that help it look just like leaves floating downstream. On the Davidson River fish will move aside when brightly colored indicators come through a run so having yarn is crucial. Because the yarn doesn’t float as well as the above mentioned indicators lighter strikes are much more detectable as well. Low to Medium Water on both the Watauga and Davidson are perfect condtions for these indicators. I first used foam stick on indicators on the South Fork of the Snake during PMD emergences. Fish really key in on the emerging pmd stage and can be quite picky about the nymphs/emergers they eat. They are feeding close to the surface but not enough to see them eat the fly. Because the fish are so shallow you have to have something tiny. These indicators are often smaller than a dime. They are feather light so make no noise. They also stay really well on the small tippet sections I often want them on. They won’t float much weight and they leave a small amount of residue on your leader when you remove them, but all are small prices to pay when you need the 007 stealth. Like yarn fish don’t spit these very fast and they go down with minimal pressure. Low water on the Davidson River is a great time for foam stick ons as is a mayfly hatch on the Watauga River. These three are by no means an all encompassing list. Just the three I use the most. Some of the others like corks, twist-ons, and other types of foam indicators have their time and place, but I think with the three types above you can handle 99% of all the situations out there. Below are links to many of the products I mentioned. 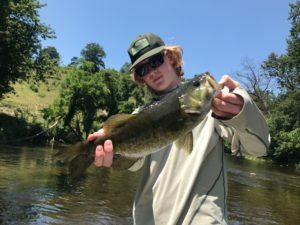 Black Scout Survival is back in Asheville fly fishing with Brown Trout guide Josh Gorelick again. Cool video gives you a sense of where we fish and what we fish for. 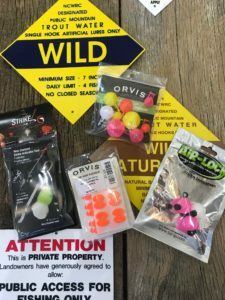 Josh gives a great rundown on some of the bugs that hatch on the trout streams around Asheville in the spring. Thanks Black Scout! We have gotten pounded by rain this month. We have had over 12 inches of rain in Asheville, NC as of May 29. A lot of people have called to ask us whether or not we can still fish and if we have any tips for how to successfully fly fish when the waters are raging. There is a point where we just cannot safely or productively catch trout on the fly, and we have cancelled several trips for that reason. The good news is that the Delayed Harvest and Wild Water trout streams in our area clear fast and while they may stay high you can catch trout. When you have high water the fish look for slower spots. That means they go to the bottom of the rivers or the side. We either add a ton of weight and dredge the bottom with stonefly nymphs and worms flies or we put on a shallow dry and dropper rig and fish the eddies along the edges of the river. In the spring trout metabolisms are at their peak and so are the aquatic insects hatching. We have yellow sallies, cahills, small blue winged olives, drakes starting, some salmon flies, and assorted caddis. The high water knocks a bunch of nymphs off their perches and the water is full of food. The other advantage of high water is that the fish usually can’t see you coming. Rough water is hard to see through and its very noisy so sneaking up on trout is usually much easier in high water. We typically catch fish on high water within 20 feet of us. You can also fish with pretty heavy tippet. Typically in Pisgah National Forest and other Streams around Asheville we use 5x and 6 x tippet. When the water is high we can use 3x and 4x. That makes fighting trout in rough water much easier and we lose many fewer flies. 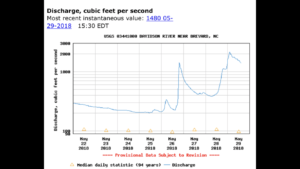 The photo on this post is a 7 day history of the Davidson River. It’s a stream that clears very fast and as soon as you can safely wade it fish are on the banks feeding. Give us a call if you ever need a guide to show you some of the high water techniques listed above. Spring has sprung, and as summer approaches, anglers might begin to see their local trout streams getting too warm, too low, and not to mention too crowded due to the influx of summer traffic, aka “tube hatch.” Because of this, anglers tend to seek alternate species to pursue in the anticipation of warmer months ahead. Opportunity knocks with warm water fish like bass, bluegill, carp, and gar, all of which offer rewarding experiences in many ways. From your local lake or river, to even a farm pond, there is a good chance that there are at least a few species you may find. I grew up fishing for Largemouth Bass in the lakes of Alabama and Georgia, and then found my love for Smallmouth Bass by exploring local rivers along the way. 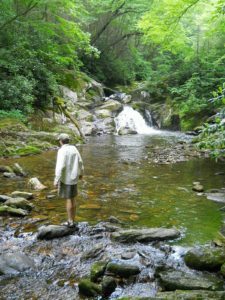 It wasn’t until I moved to Western North Carolina that for the first time in my life, I had lakes and rivers within 45 minutes to an hour of Asheville that provided me with access to numerous species; and better yet, that access wasn’t limited. Oftentimes, when people think of bass fishing, they think of spin rods, glitter bass boats and Evinrude 250s….that’s cool, but most folks either only have enough time to wade, or they don’t have any friends with a bass boat. The problem is, a lot of these rivers can’t accommodate the launch of a Bass Tracker anyway, but they are easily accessible to waders, rafts or kayaks. My advice is, make friends with someone who owns a bass boat…you’ll thank me later. The truth of course, is that you don’t need a spin rod or a motor boat to find and catch warm water fish, including bass. 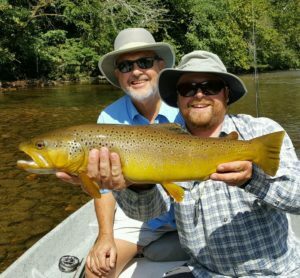 If you’d like to try your hand at catching one of these beauties with a fly rod, then you may be wondering what to bring with you. Depending on your fly selection and the type of fish you’re after, I would recommend either a 7wt or 8wt rod with a floating line, but having a spare spool of sink-tip line is not a bad idea, also. In your box, flies should range from baitfish, crawfish, and hellgrammite, to frog patterns. 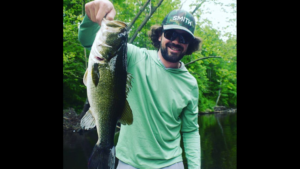 Poppers in all sizes can make for a fun day if the fish are hitting top water. Leaders should range from 7 to 9 feet, and between 10 and 15 lbs. On your feet, wading socks can allow you wear wading boots if preferred, but in warmer temperatures, sandals/water shoes are adequate and may be more comfortable. 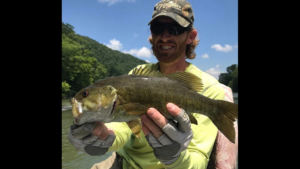 If you are interested in learning more about Fly Fishing for Bass, then please contact us at Brown Trout Fly Fishing, and book a Bass float trip on the French Broad, Pigeon, or Tuckasegee Rivers. The Mother’s Day Caddis hatch is probably just a little over a month away. If you’ve nymph fished with us, undoubtably you’ve ripped your flies off a bottom snag only to find you were merely hung on a cased caddis. Our caddis build their houses with leaves and sticks and form a square based long pyramid. The larva inside is a bright green grub-like animal with black legs and head. These guys are usually found in the riffles and tail-outs from the Doe River down to Boone Lake. Usually they hatch the third week in April, but warmer weather will create an early emergence. They are pretty reliably out when the dogwoods start blooming in the mountains. The nymphs are large, size 10-14 and the adults are barely smaller. We get them swinging pupae and fishing dry dropper whenever the hatch isn’t actively bringing fish up. These bugs get so thick you could choke on them, and are the first decent sized insect of the year, so we find large trout feeding on adults.